After the lights went out and the dust settled from the 80th take of the Midsummer Classic, fans spilled out of St. Louis' beautiful new Busch Stadium into an area set to be developed as Ballpark Village. Ballpark Village is much like The Banks development in Cincinnati. The idea is similar - following a major public investment in a new urban ballpark, a high density mixed-use neighborhood would fill the space left behind from the previous behemoth of a stadium that once existed. This new wave of thinking towards sports facilities is a trend sweeping the nation that can be seen in cities from San Diego to Baltimore and minor league parks all across the nation. 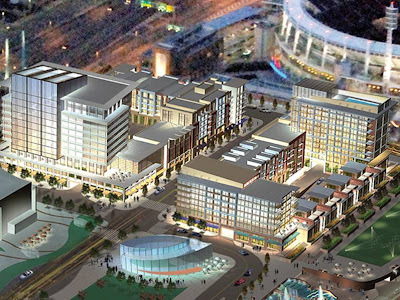 The idea is that new businesses and entertainment districts can thrive off of the tens of thousands of sports fans visiting the area 80+ times a year. Both The Banks and Ballpark Village have suffered their setbacks. In both cases beautiful new ballparks have replaced the cookie-cutter stadiums...that part of the equation has been fulfilled. What has not yet been completed is the high density mixed-use neighborhood. 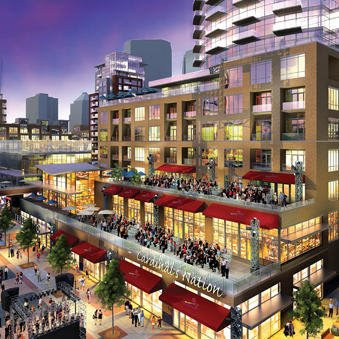 There is no doubt in my mind that once developed, both Ballpark Village and The Banks will be successful if executed properly. The problem is that the execution has little to do with the ballparks built to spur these developments. In St. Louis the amount of residential space has been reduced from the original plan. In Cincinnati condos have become apartments, and the design has been "value engineered" to say the least. What could any ballpark do to change these results? What the ballparks do accomplish is that they create an instant market for such "eatertainment" places like ESPN Zone, Hard Rock Cafe, House of Blues and so on. These places are perfect for these districts, but I honestly don't see what else the ballparks can do otherwise. 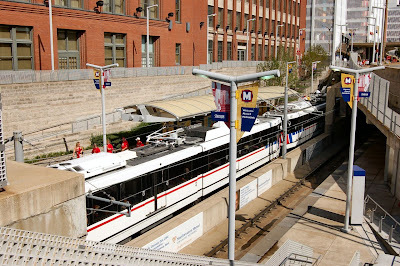 In St. Louis Busch Stadium is connected with the region's light rail system with a perfectly situated MetroLink station. Cincinnati has the opportunity to similarly connect Great American Ballpark with the Cincinnati Streetcar system. The important thing to vibrant urban neighborhoods is the amount of people. Downtown Cincinnati and St. Louis have no problem with daytime work week activity. What they both need more of is night time and weekend traffic, and this requires more people living within the core. Less residential at these developments is the absolute wrong idea. Transit makes high density residential more financially feasible, and has a considerably greater impact than that of a neighborhood ballpark. Great neighborhoods aren't made by great ballparks...great neighborhoods are made by the people living, working and playing there. A diversity of these activities is needed for a place to be truly sustainable in terms of its vibrancy, and instead of pouring our public dollars into new ballparks, stadiums and convention centers we should be putting our public money into transit choices, public spaces and a diverse housing stock. "Following a major public investment in a new urban ballpark, a high density mixed-use neighborhood would fill the space left behind from the previous behemoth of a stadium that once existed." This raises an important question -- what happens in 30 years when we (or our teams) decide that Paul Brown Stadium or Great American Ballpark aren't good enough and demand a brand new stadium? Unfortunately the life span of a major league sports stadium is very short. Hopefully, with these stadiums being well-designed (not generic like Riverfront Stadium) and surrounded by The Banks, we would renovate rather than rebuild elsewhere. Alternatively, I also hope that The Banks becomes a strong enough neighborhood that it is desirable with or without the stadiums. And we can always think of a creative solution -- like building a new ballpark where USBank Arena is currently, and expanding The Banks over the old GABP land. Sorry to change the topic and think a generation ahead before The Banks is even finished! I'm not sure Riverfront was any more generic than Great American Ballpark. 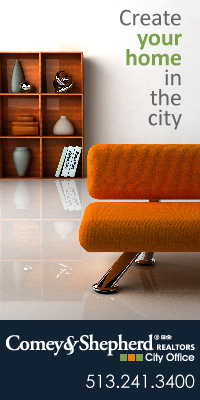 It did however epitomize the modernist way of thinking about urban space. GABP is an improvement on Riverfront in the sense that it isn't so distinctly separated and insulated from its surroundings. It is pretty boring though. In my mind putting GABP at the river was a huge mistake. Private investment wasn't able to follow GABP or Paul Brown without further massive publicly funded project (the banks). I don't think that would have been the case at Broadway Commons. Kind of off topic, but whatever. The stadiums have spurred development and growth. Just not where in intended. Because the stadiums are surrounded by water, interstate, existing development and city/county owned property, development occurred in only available spaces: Northern Kentucky. Broadway Commons looks like genius these days. I love GABP, but it was a stroke of idiocy to keep using riverfront property as sports venues. These are all reasonable critiques and completely on-topic if you ask me. Thanks for the comments. Randy, how do you feel about a grass roots movement to get the All Star game here in Cincinnati? I believe the next opportunity for an NL host city is 2013 or 2015? This would just about the time The Banks would be done. I think an All-Star Game at Great American Ballpark would be great for the Reds and great for the city. I'm glad it wasn't pursued right away, because I think it will be much better for both the city and Reds to have the first phase of The Banks completed, have the streetcar running, and a completed Great American Insurance Tower (Queen City Square II). not sure how i feel about downtown ballparks, and not sure how i feel about this post. the last statement says "don't build," but all the other statements say "build it, but build it correctly." when i think of the Giants Stadium in SF, i think...SUCCESS! i hate baseball, but i love that damn park. when attending, anyways. other times, it's kind of dead. but they left open access to the waterfront -- a multi-use path for bikers and walkers/joggers/moms/babies/doggies/etc. and sf is 2nd most dense city in America, so it was really never hurting for more people. development in the area is continuing, and all looks essentially fine. lots of folks commute by bike to the game b/c it's right downtown. and if you're going to have a big stadium anywhere, where else would you put it? out in the sticks? it seems to me that downtown ballparks are doable, but they have to be done right -- permeable membranes where possible, ground-floor retail, open access to the water, etc. that said, cities should never subsidize highly profitable sports franchises. like the 49ers are blackmailing SF right now -- i say, 'bye!'. my little Augusta, GA (2nd largest city in Georgia) is considering moving it's single-A baseball team (SF Giants farm team) to downtown, along the river, from a place about a mile away. should we do it? My comments are torn because you can build a good urban ballpark, but that does not mean it is the right way to go about revitalizing an urban area and creating a vibrant neighborhood. Lots of cities have built them, and I would say that they're better off near the center city than not as they can be connected with mass transit and other amenities. But with that said, some cities (like Cincinnati) put millions and millions of public dollars on the table to make it happen. The two new stadiums in Cincinnati take up prime riverfront real estate and combined they aren't even used half of the days out of every year. If you want to build an urban ballpark then great, you should. But I guess my point of view is that this whole ideology of building ballparks as a means of urban revitalization is a bit flawed. Instead you should focus on quality of life issues and make the area a great place to live, work and play.